This post originally appeared on Minxeats.com on July 22 2009. Mr Minx and I went to H Mart last week to pick up some needed staples: Kewpie mayo; dark soy; noodles; Mexican chorizo. I also wanted to pick up some chile bean sauce to use in Sichuan cookery. You see, after reading Fuchsia Dunlop's excellent Shark's Fin and Sichuan Pepper, I bought her Sichuan cookbook, Land of Plenty. 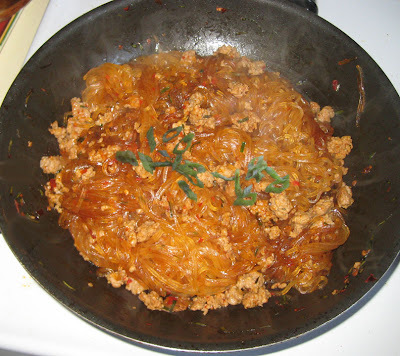 The first thing I attempted was "ants climbing a tree," or, vermicelli noodles with ground pork. I had eaten an excellent version at Grace Garden and wanted to recreate it. Unfortunately, this recipe didn't do the trick. My noodles were spicy and salty and that's about it - missing any nuance of flavors found in Chef Li's version. 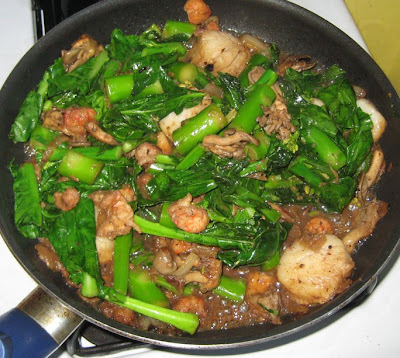 I kinda had an idea that would be the case, so I also cooked up a stir fry of scallops, langoustine tails (advertised as such at Trader Joe's but they sure taste like crawfish to me), oyster mushrooms, and gai lan (Chinese broccoli) in black bean sauce to go with. I love how gai lan is both bitter and sweet at the same time. Next time I have a hankering for ants climbing a tree, I'll try this recipe. Or this one. 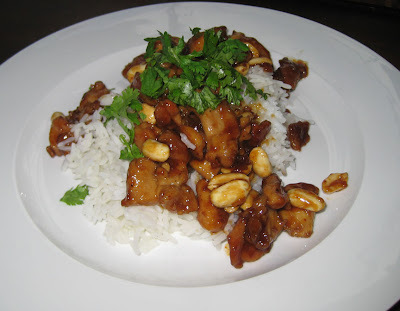 The second recipe I chose from Land of Plenty was for a family favorite, kung pao chicken. It was scrumptious, and my house now smells like a Chinese restaurant - sweet, meat, and garlic. I didn't use the "generous handful of dried red chiles" called for because 1) I didn't have them; 2) I like spicy food but I didn't want to hurt myself; I used cayenne instead. I'll definitely make this one again, maybe with shrimp next time. 1. Place chicken in a bowl with marinade ingredients, set aside. 2. Combine sauce ingredients in small bowl. Add minced ginger. Set aside. 3. Heat a large skillet and add 2 tablespoons of cooking oil. When hot but not smoking, add chicken and after chicken cubes have separated, add ginger and white part of scallions. Stir fry until the meat is cooked through. Season with cayenne and, if you have it, ground Sichuan pepper. 4. Stir the sauce and pour into the pan, continuing to stir the meat. When the sauce is thick and glossy, stir in the peanuts and remove from heat. 5. Garnish with scallion greens and serve with rice. Serves 2 - 4, depending on appetite and side dishes.